Got My Vitamins - Hairlicious Inc.
Hi Sunshyne! thank you for the blog post, you posted it at the right moment for me. 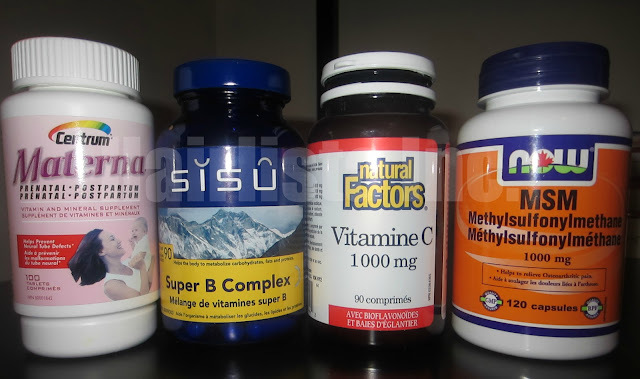 I will receive my vitamins this morning, and I was asking myself whether I should take them before, during or after meals... what is the best moment according to you? I ordered (1) B Complex with Vitamin C, (2) MSM 1000 mg, and (3) Biotin 5 mg. I intend to take 1 tablet daily for the B-complex with Vitamin C and the MSM, and 1 tablet every other day for the Biotin... Is it ok? Looks good! Best healthy wishes for 2013!! Just wanted to add for those who want to follow your good example but dont have money to buy all those tablets. C-vitamin is found in all fruits and vegetable. Oranges, cabbage and tomatoes specifically but also potatoes, carrots and all other vegetables of colour are rich sources to C-vitamin. Very few people are low on C-itamin. So if you are eating fresh fruit and vegetables every day, not very big amount needed, A glass of natrual juice cover your daily requirement, then yuo can skip the c-vitamin an focus on the other food supplments. Thank you very much for the list of alternatives! Very true. Hi Charty, I'm glad I posted it then :). You don't have to take the pills with meals. From what you've mentioned your plan sounds great. The biotin dosage is very high so make sure you drink a lot of water as acne could be one of the side affects. Hi Sunshyne. I look forward to your BTR blog. In the meantime, though, how often are you doing them? I've only done it once. I believe once a month is sufficient. Ok, thanks dear!!! Yeah, for the Biotin I was wondering about the dosage, and since acne is always knocking at my door (poor me... LOL) I think I should just take it once a week. Yes, space it out and see how your body reacts. With time, you can increase the frequency. Your hair is beautiful and I have started the vitamins myself, for regrowth and healthier hair. Right now I'm only on biotin,calcium and going to get my multi-vitamin. Thank you hun!! That's a good start. A Multi is very important. Get that as soon as possible. How much water would you recommend drinking due the the Biotin making you more acne prone? I would say 8 glasses of 8oz of water a day should do it. Sunshyne your hair is glorious! However, please be careful with the IRON supplementation - if you are not pregnant or planning to be very soon it can accumulate like most metals within the body and eventually become poisonous and cause constipation. Otherwise, I think your regimens are great! Many blessings to you!